11/13/18 Hell and High Water, with Meria and Chuck Ochelli. The circus of trump; France -rain; Arlington-rain; No.Korea trumped trump; Market drop; midterms a referendum; Acosta; the entitled; no human compassion/empathy-only blame; 85 investigations, will they be limited? the new progressives elected; Whitaker; Is trump sick; Maryland and Rosenstein; Ocasio; Bernie-crats; Sinema’s win; Puerto Rico, California; trump hates his own people; cybersecurity? Antifa? MSM and their sponsors; Stan Lee’s death; Corsi & Stone; women vs.Bannon; thumb drives; Nixon; Senate only represents 18% of us; Military abused; vote count and elections; what happened to the “caravan” and lots more. 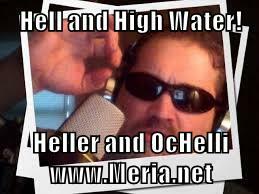 2 Responses to "Hell & High Water with Meria and Chuck Ochelli"
Thank you Meria and Chuck for consistently keeping “Hell and High Water” interesting, informative, and fun!